In medium bowl, stir together Bisquick mix, cocoa, sour cream, milk, eggs and sugar just until combined. Stir in chocolate chunks. Spray griddle with cooking spray; heat over medium heat. For each pancake, pour slightly less than 1/4 cup batter onto griddle. Cook until bubbles form on top and edges are dry. Turn; cook other side until set. Meanwhile, in small microwavable bowl, microwave hazelnut spread uncovered on High 30 seconds. Stir in chocolate syrup. Cover to keep warm. 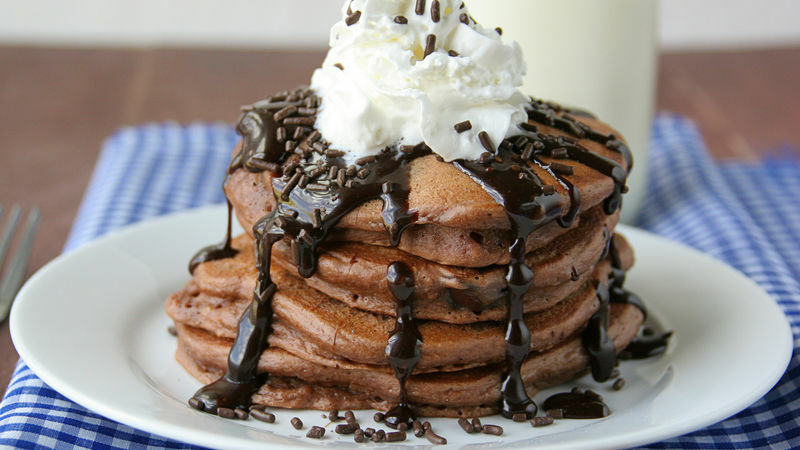 Serve pancakes topped with chocolate-hazelnut sauce, whipped cream and sprinkles. If you don’t like hazelnut spread, skip step 3 and just serve the pancakes with chocolate syrup. Make sure the griddle is hot before starting to cook the pancakes to ensure they cook evenly.